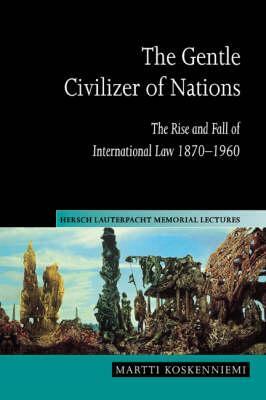 International law was born from the impulse to 'civilize' late nineteenth-century attitudes towards race and society, argues Martti Koskenniemi in this extensive study of the rise and fall of modern international law. In a work of wide-ranging intellectual scope, now available for the first time in paperback, Koskenniemi traces the emergence of a liberal sensibility relating to international matters in the late nineteenth century, and its subsequent decline after the Second World War. He combines legal analysis, historical and political critique and semi-biographical studies of key figures (including Hans Kelsen, Hersch Lauterpacht, Carl Schmitt and Hans Morgenthau); he also considers the role of crucial institutions (the Institut de droit international, the League of Nations). His discussion of legal and political realism at American law schools ends in a critique of post-1960 'instrumentalism'. This book provides a unique reflection on the possibility of critical international law today. Introduction; 1. 'The legal conscience of the civilized world'; 2. Sovereignty: a gift of civilization; 3. International law as philosophy: Germany 1871-1933; 4. International law as sociology: French 'solidarism' 1871-1950; 5. Lauterpacht: the Victorian tradition in international law; 6. Out of Europe: Carl Schmitt, Hans Morgenthau and the turn to 'international relations'; Epilogue.